I found this RPPC on eBay a few weeks ago. 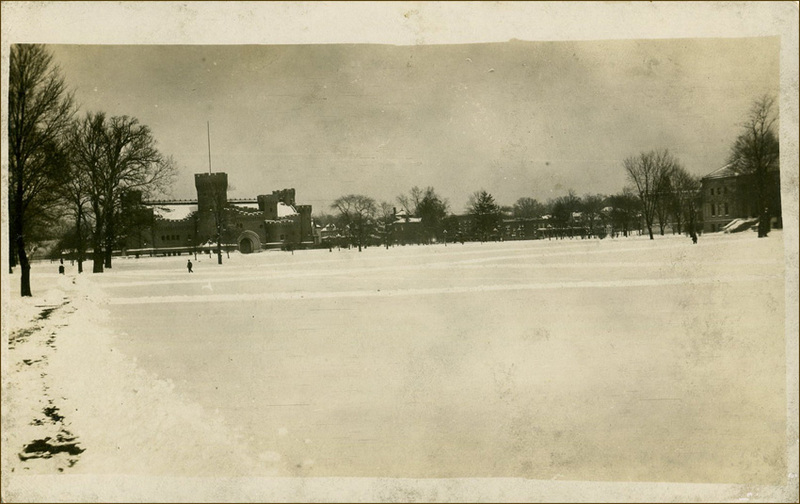 It depicts the east side The Oval at Ohio State University, looking towards High St. and east 15th Ave., on a dark, cloudy, snowy winter's day sometime in the late 1910s. The early decades of the 20th Century saw the United States swept by a mania for postcards. In the first two decades of the century, Americans sent each other hundreds of millions of the postal greetings. They were the Twitter or Instagram of their day. Folks dashed off a quick status ("I'm here now," "Arrived safely," "We visited this today") and sent it and a picture of where they were to friends and family back home or across the country. To capitalize on this popularity, Kodak manufactured a camera that took photos which could be printed on heavier paper, in the 3.5" by 5.5" postcard format, and sent through the mails. Collectors today call these Real Photo Postcards (RPPC). The great thing about Real Photo Postcards is that they were shot by everyday people, choosing subjects that were personally meaningful to them. Printed postcards are professionally photographed, carefully composed, sometimes staged, retouched, tinted, and focus on the beauty spots and locations of note. They show what the Chamber of Commerce would have wanted you to see. RPPCs show the real world as it looked to real people. If you had a time machine and set down back in 1912, the RPPC is more like the view that would greet you. Below are some details from the photo, enlarged and enhanced with a little Photoshop magic. (5) 1862-76 N. High, still extant, (6) 1852-60 N. High, still extant, (7) Rowhouses along E. 15th at High St., (8) The Ohio Archaeological and Historical Society Museum, built 1913, and (9) Page Hall, built 1903.